A central grooved channel separates the Versus from the standard Arione model, making it perfect for those seeking a little extra pressure relief in the same popular shape. Wing Flex shape allows increased pedaling power and comfortable thigh movement. Long shape allows for comfort in more riding positions. K:ium rails are lighter and stronger than Titanium. 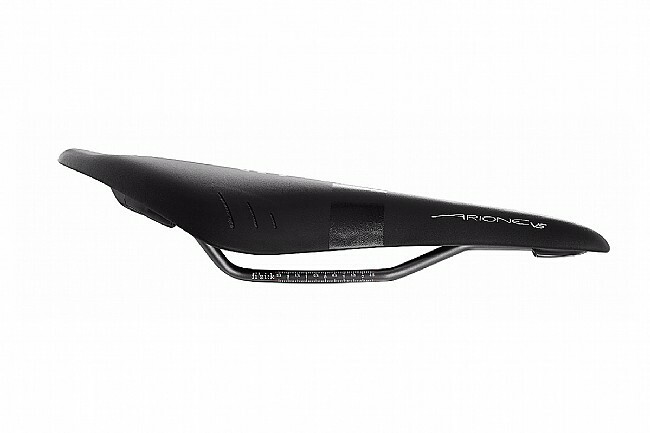 Compatible with Fizik ICS saddle packs and lights. 300mm Long x 132mm Wide. Black Microtex cover with glossy black wings. 225g. I must admit that 30% of the reason I got this saddle was Fizik's nifty tail light. I've been looking the saddle&light combo solution like forever. I selected the Versus line bc of the middle channel. I rode almost 5,000 miles on a Selle (with center cut out) and occasionally felt numb about my groin. Not good right? So I was excited with this new saddle. Well, after my first ride my thought was why I waited so long to get this saddle? Probably the best saddle I rode for a long while (there were several before the Selle). Not one minute that I felt any numbness in that sacred area..And the back pain virtually gone! Impressive. This is the saddle for me! more rides will tell me if this is the perfect saddle, but now I am so happy with it. Before getting this saddle, I suggested go to Fizik website to read about different types of saddles and riders. WesternBikeworks has the best price right now.